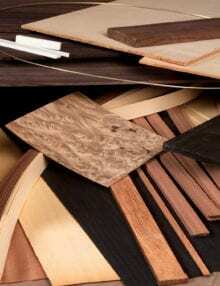 The complete classical guitar wood kit includes all the wood necessary to construct either the guitar in the book or the DVD box set using my methods. J.S. 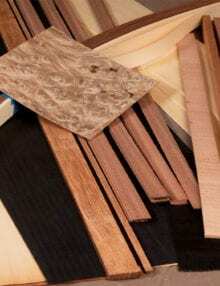 Bogdanovich Guitars has partnered with Allied Lutherie to provide some of the high quality wood for the kits. Complete kit includes top, back, sides. neck, all laminations, wood for details, bracing, bridge blank, nut saddle and fret wire. The wood details kit includes all the hard to find wood necessary to create a guitar using the building methods in the book and dvd. An elegant color scheme for the guitars’s details has been selected that is different from both the book and the dvd. The components are put together the same way as they are in the book and dvd, the advantage is this scheme will work for both a spruce or cedar top guitar just about any back and sides wood. Kit includes side and lining laminations, detail and headpiece veneer, bindings and back strip, cross-grain back center patch and veneer for creating the wheat motif and rosette center ring. Purchase the entire kit for a savings. The classical guitar rosette kit contains all the material necessary for producing an elegant rosette like the signature J.S. Bogdanovich rosette. The rosette kit color schemes have been designed to work well with either a spruce or cedar top guitar. The black and yellow motif is the same as the scheme in the book and the brown and yellow motif is suited for a rosette similar to the one in the dvd. Drawings of possible motifs included.